Have the experience of a lifetime when you participate in the Dolphin Encounter at Playa del Carmen. The perfect experience for all ages, you will swim with the dolphins, experience their tricks, and learn about these fascinating creatures all at one of the world’s most beautiful beaches. 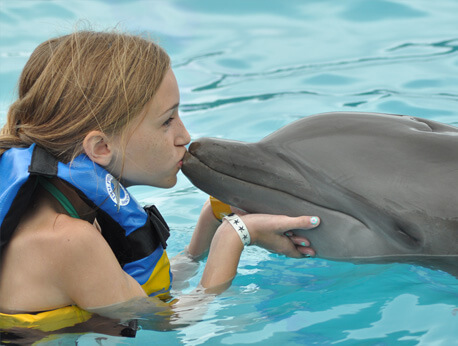 You and your loved ones will enjoy a truly magical experience at your Dolphin Encounter in beautiful Playa del Carmen. Visit one of the most beautiful beaches in the world and let the pristine sand, sparkling water, and bright sunshine provide the perfect backdrop for memories that will last a lifetime. Perfect for all ages, this encounter begins with a complete introduction to the fascinating, underwater world of the dolphin. Our trained experts will cover fun facts and interesting information about these amazing creatures. Learn how they behave, what they eat, and how they communicate. This is a great introduction for dolphin lovers and animal enthusiasts. Then it is time to get in the water with these gentle, friendly creatures. Once you’re in the water, the fun really begins. Interact with the playful, curious dolphins. The small group sizes ensure you get plenty of one-on-one time while in the water. As one of the largest dolphin habitats, this is the perfect location for this type of experience. All the animals are well cared for and respected, making it a safe, fun experience for the whole family. Plus, everyone in the encounter will get to experience some amazing tricks, including a handshake, hand target, kiss, and hug from the dolphins! The grace and beauty of the spectacular dolphins will take your breath away and leave you with the experience of a lifetime. In addition to your fun time with the dolphins, your encounter includes round trip transportation, lunch, and beach club access. You’ll find plenty to do at this scenic beach, whether you like to lounge in the sun, play in the water, or both. Lunch at the Cocoteros restaurant is sure to satisfy anyone’s taste with a variety of options ranging from delicious, healthy salads to scrumptious fajitas and more. To have the best possible experience, please take note of the following items. Transportation must be arranged at least 24 hours in advance. Also, showers are available, but please ensure you bring towels for everyone in your group. The safety of our patrons and dolphins is very important, so please keep that in mind. Children under eight years of age will need a paid adult to swim with. The use of life jackets is required while in the water. Women more than five months pregnant are restricted from participating. Also, be sure to wear biodegradable sunscreen which is safer for our wonderful animals. Kids younger than 8 years old must swim with a paid adult (+18). Infants from 1-5 years old swim free with 1 paying adult.